Heat oven to 325°F. Grease 1 1/2-quart ovenproof bowl (8 inches across top) and three 8-inch round cake pans with shortening; coat with flour (do not use cooking spray). In large bowl, make cake batter as directed on boxes. (Both boxes of cake mix can be made at one time; do not make more than 2 boxes, and do not increase beating time.) Pour 3 1/4 cups batter into 1 1/2-quart bowl, and divide remaining batter among 3 pans (slightly less than 2 cups per pan). Bake cake pans 23 to 30 minutes and bowl 47 to 53 minutes or until toothpick inserted in center comes out clean. Cool 10 minutes. Remove cakes from pans and bowl. Cool completely, about 1 hour. Place cakes in freezer 45 minutes before cutting to reduce crumbs. Cut off rounded tops of cakes. Cut bowl cake in half horizontally. Cut 1 3/4-inch diameter hole in center of all 5 cake layers. Spoon frosting into large bowl. Stir in food color until desired pink color. Place one 8-inch cake on serving plate; spread 1/3 cup frosting over top. Top with second 8-inch cake; spread with 1/3 cup frosting. Repeat with third layer; top with larger bowl cake layer, cut side up. Spread with small amount of frosting. Top with rounded bowl cake layer, cut side down. Trim side of cake if necessary to make a tapered "skirt." Spread thin layer of frosting over side and top of layered cake to seal in crumbs. Freeze cake 30 to 45 minutes to set frosting. Spread frosting over cake as desired. Wrap hair and lower half of doll with plastic wrap. 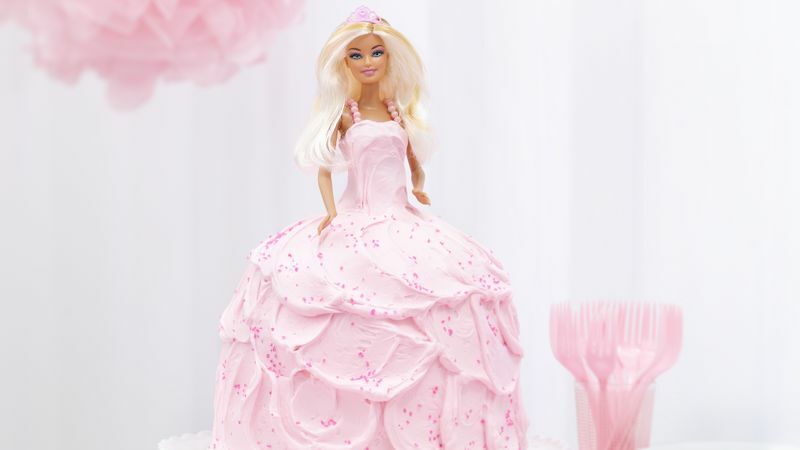 Insert doll into center of cake. Frost body of doll. Decorate with sprinkles and candy pearls as desired. Unwrap hair. Store cake loosely covered. Get a party menu, prep guide, tips, party games, activities and more for a Princess Party! Do you need to bake cake layers in batches? Just cover and refrigerate remaining batter in the mixing bowl while the first batch is baking. An extra minute or two for baking the second batch may be needed.